Animated: No; Low-poly: No; Materials: No; Rigged: No; Textured: No; UV Layout: No; 3D File Formats Included: .max (3ds Max); Created In: 3ds max 2017; Geometry: Polygons; Poly Count: 1, 182, 085. Great Scott. This is heavy Doc! Don't worry Marty, we need this 3D time machine for future reason. Including Flux Capacitor! Car and components are grouped, you need to ungroup them. Detailed high polys exterior model including cables and wires based on the movie part 1. Interior are also included. Warning : You need 1.21 jigowatts to open this file! Note : Rendered thumbnails are just preview, you need to setup on your favorite rendering engines. 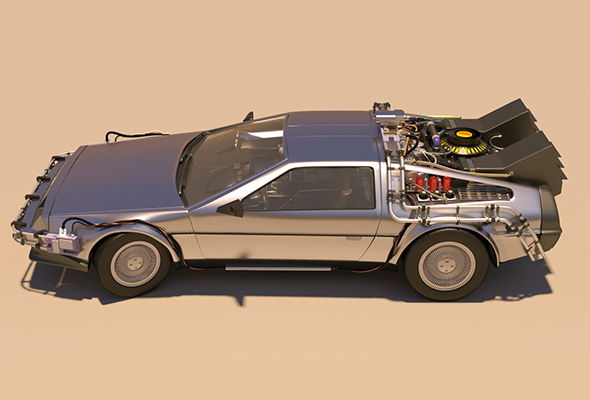 Keywords: bttf, car, delorean, dmc, future, scifi, sedan, transportation. Best stock graphics, design templates, vectors, PhotoShop templates, textures & 3D models from creative professional designers. Create 3DOcean DMC Delorean Back to the Future part 1 20977986 style with PhotoShop, Illustrator, InDesign, 3DS Max, Maya or Cinema 4D. Full details of 3DOcean DMC Delorean Back to the Future part 1 20977986 for digital design and education. 3DOcean DMC Delorean Back to the Future part 1 20977986 desigen style information or anything related.